WBA I/C female featherweight (but 57,2 is a little over 126) title. WBA I/C cruiserweight title. 119-109 twice and 118-110.
vacant Belgian 147 lb title. Wlodarczyk won this final IBF eliminator with a close, split decision. It was scored 116-112 and 115-114 for "Diablo" and 115-113 for Gevor. The winner here could well be one of the participants in the WBSS tournament. 95-92, 98-92 and 98-91. Szymanski had some problems with the veteran Jackiewicz but came through with a clear win. Chervet was floored three times in the second and stopped. Chervet is suspended 28 days by the Swiss Federation. WBFed Int´l title. Derghal down twice in the second, once in third and a final time in the seventh before it was stopped - all knockdowns from bodyshots. French heavyweight title, scored 98-92, 98-91 and 97-92. Daser won the IBO Int´l and WBO Euro titles with an easy win over the washed up / out of shape Afolabi, who sank down twice in the third and the towel came in. Daser is a self made millionaire in real estate. 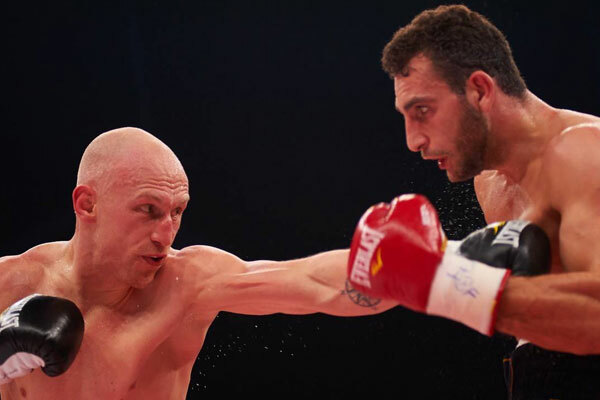 Mikhalkin won the vacant IBO 175 lb title on scores of and became EC Boxing´s first world champion. Keles won the vacant WBO Euro title on scores of . Harutjan was floored in the eighth and that probably decided the fight. Todorovic came to town on short notice to fight Edmund Gerber but ended fighting Cinkara on even shorter notice, broke the nose and was stopped. Masson the vacant EBU title by stopping Hryschuk. IBF final eliminator. Vitu´s EBU title not at stake. Matano was down in the ninth and tenth but was ahead on two scorecards at the end 86-84 and 85-84 with Vitu up six points on the third. Hamadouche retained IBF female 130 lb title. The crowd bood Hamadouche for use of head and elbows in her all out attack. Petit won the EU 140 lb title on scores of 115-113, 118-109 and 118-110. Toutin won the French 175 lb title by knocking out Kasperski with a left hook to the body. Ziani won the French 130 lb title on scores of 97-94, 97-93 and 95-95. Demchenko won the vacant EU 175 lb title in a big upset on scores of 48-47 twice with a 49-46 score for Zoulikha on the third card. Demchenko got big cut after an accidental headclash.